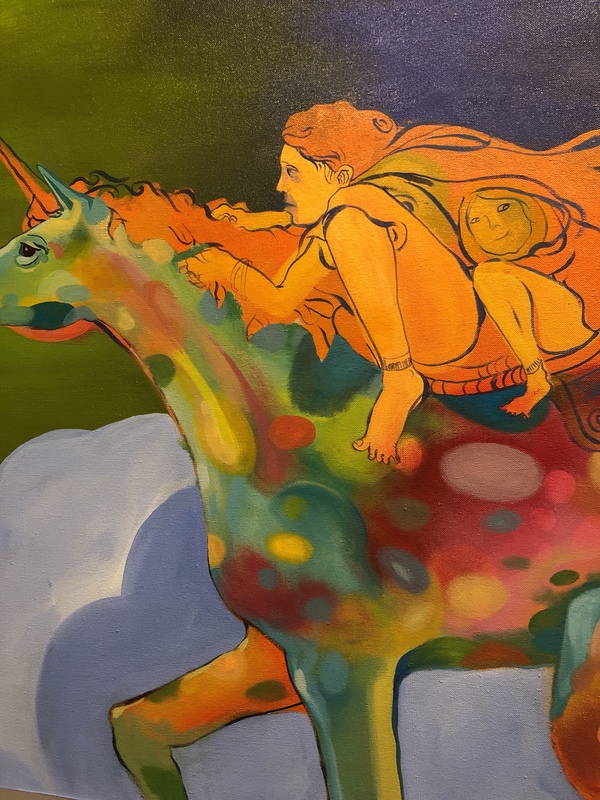 Update: The large unicorn at the The Tree House, it’s the studio behind Sis and Moons. Come by and visit any time, Alpharetta, Ga. Here is one of the running dogs, lots of work left. Unicorn being followed by rabbits and dogs. First large painting for the New Year. I have been fermenting on this idea, image for a while. Working on the big side today. I want to make easy, coloring book style, fills. I’m attempting to speed up the Clem head making process. Going freestyle on each head is SUPER fun but now I need to refine this project. Making a standard template for the drawings is a first step. The sketch, transferred to the linoleum block. Ready to cut. Removing background, kinda quick and dirty. Refine as you go. Working the interior, dog face and eye. The goal is to turn sketchbook into a coloring book. Working and getting excited about this new, in-progress, body of work (5×7 collage drawings, done with paper, paint and ink.) will be shown at the Hive Gallery in May for “The Lines Attack” show. I have been attempting to illustrate a narrative that until now only lived in my sketchbooks, it’s a fractured series of vignettes that record my musings as I commute around the planet. Some of which, “A study on animal development in responds to auto injuries (in fast forward)”, and A rumination on advances in facial hair despite contrary marketing. 16, 5×7 inch paper drawings, Alex Feliciano 2014, for “The Lines Attack” show in May . Natural responds to trauma, as seen in fast forward (less bones). Wind blown beard and striped suit. 4 New masks before Halloween… a cardboard challenge. Final paint job and some minor fabrications to the base, it is now wall mountable. 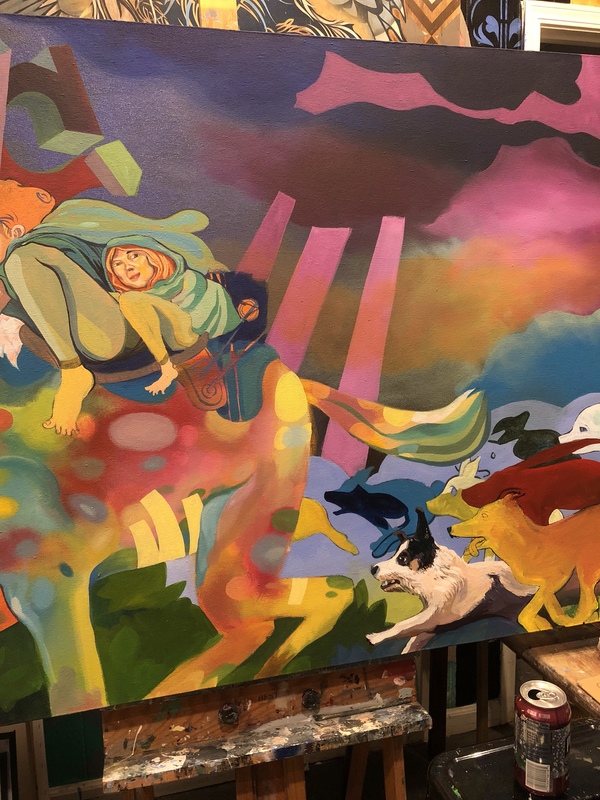 Below is a picture from the Back of Sis and Moon’s gallery, with Rachel Graham and Wendy Vogt, the dog head is almost done. The second Mask is done… meet the Sugar Skull. Here is the Sugar Skull hanging up at Sis and Moon Gallery in Alpharetta, GA. The first Mask is done… meet the Thunder Lizard. Damien with the Thunder Lizard. 50+ cardboard tiles cover the head eyes and jaw. hand painted and now on sale at Sis and Moon gallery in Alpharetta GA. Started the base coat on all four masks and begin prepping the Thunder lizard. It got a set of hand carved teeth screwed into some cardboard mounts, more tiles and eyes, next step COLOR. I will be updating throughout the process or till Halloween which ever comes first. So last night Tuesday (day three oct 8th, 2013), I put the kids to bed and then started working on the Thunder lizard (picture to the right). I painting the tiles, added highlight, added even more tiles and made a bottom jaw. I’m going for a Aztec ish look. This is a picture of me wearing the Thunder lizard this morning, very tired, trying on the mask helped keep me going. Seeing out of the mouth, is good. Add more fins to the sides. Behind the head is open, easy on easy off. Three more masks to go. Below is a larger image. Tuesday night / Wednesday morning, Larger Image from you can see the jaw tapper under the teeth, and the jaw hinge. Wednesday night / thursday morning, Boom, a Thunder Lizard. It is at Sis and Moon gallery in Alpharetta, Ga. It’s about 32 x 32 inches (ish), made out of cardboard, glue, acrylic paint, wood screws and some wood for the teeth. It took four day to get here: build, fabrication, paint and assemble. Ha, just fun with glue and cardboard. I was going for something that spoke to an fun Aztec design. My kids helped paint the Thunder lizard tiles and had lots of ideas about what colors we should use. They are very excited to see it finished but not happy to see it go to the gallery. They said, “Please don’t sell it, we’ll buy it.” I had to explain to them that if we kept everything we made there would be no place to sit down and their mom would kick me out, kisses honey. Thunder lizard, done. now head down to Sis and Moon and buy it. Damien wearing the Thunder Lizard, he made lots of scary noises, like, ” Raw Ew Uh! and Rorrhra!. When it was Oscar turn he must have had “what does the fox say” on the brain and started to chitter, “Jacha-chacha-chacha-chow” and “a-hee-ahee ha-hee!”. The Feliciano brothers rocking a sugar skull and bird style mask, these are the blank prototypes! Oscar in the bird mask and Damien in the white skull. This is the first paint and design pass. Most of the execution was random and jittery. The skull had a lot more surface area that I thought after some random starts it began to come together quickly. Saturday and Sunday, worked on a bottom jaw and the sides. the jaw will be double hinged and screwed to the head. I’ll wrap it up tonight. Pictures in the morning. Sugar Skull is done, good morning. The next morning after a late night finishing the jaw. The blue Diamond Sugar Skull is a nod to my time in LA. I am very excited to make more skulls. I wrapped up the Sugar Skull and now I’m going to start the Dog Head. I worked up this head and painted it a few weeks ago, I am going to shorten the neck and add a lot of detail panels for painting mini vignettes on the panels. Trying new tricks with the Dog Head (I need to come up with a better name). The eyes and nose are made out of Crayola Model Magic. Not sure about the paint job, wish me luck. Going with a gold theme, maybe, I need to focus and figure out what it (the masks) wants. more, I need to listen better, Late night.